The title says it all: a variation from the sakura/ cherry blossom model. 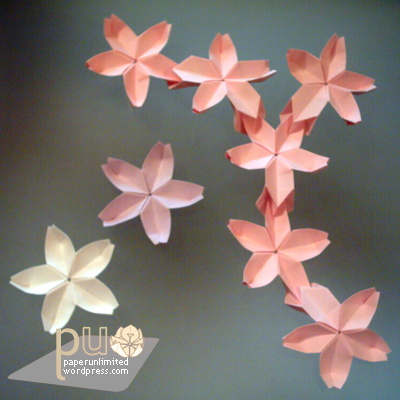 In this one you replace one or more or the petals with a double petal and start linking flowers :) and I must state that it is quite addictive… First I folded some petals and then a few double petals; when I started assembling I just had to fold some more! As you keep adding flowers it gets more and more beautiful! Once more the diagrams are by 川崎敏和 /KAWASAKI Toshikazu and may be found in 折り紙夢WORLD, 花と動物編 /Origami Yume World, Hana to Doubutsu hen, aka Origami Dream World, Flowers and Animals Volume. This entry was posted on 2007|06|20 at 19:50 and is filed under modular origami, origami. You can follow any responses to this entry through the RSS 2.0 feed. You can leave a response, or trackback from your own site. Gostaria de saber onde arranjaste esse livro, se for possivel.